The installation is on view through November 12 at the Madison Museum of Contemporary Art. Stills from "The Understory" courtesy of the Madison Museum of Contemporary Art. If you're concerned about missing something in Madison-based artist Chele Isaac's new installation at the Madison Museum of Contemporary art, don't worry: you will. The Understory, on view through November 12, lives inside a large black circular enclosure and consists of video projected on seven round screens, each curved slightly backwards on the inner wall. In a 20-minute sequence, the screens sometimes sync up and sometimes visually conflict, running through footage of everything from birds to strange floating sculptures to wisps of smoke to insects. Music from Isaac's longtime friend and collaborator Jack Kellogg accompanies the video, drawn from a large stockpile of footage Isaac has shot over the past five years. Using the almost-360-degree space, Isaac deliberately makes it impossible for the viewer to take in the work as a whole, at least in one cycle. "Things Are Supposed to Get Increasingly Beautiful Starting Today." Photo by Chele Isaac. Isaac works primarily with video, but along with that she's almost always using space as a medium. Her piece at MMOCA's 2013 Wisconsin Triennial, The End Of Angels, required viewers to mount a couple small steps and peer into a hole in the gallery wall into a room that might have been cavernous or dollhouse-sized, occupied by a dark and surreal two-channel video installation. 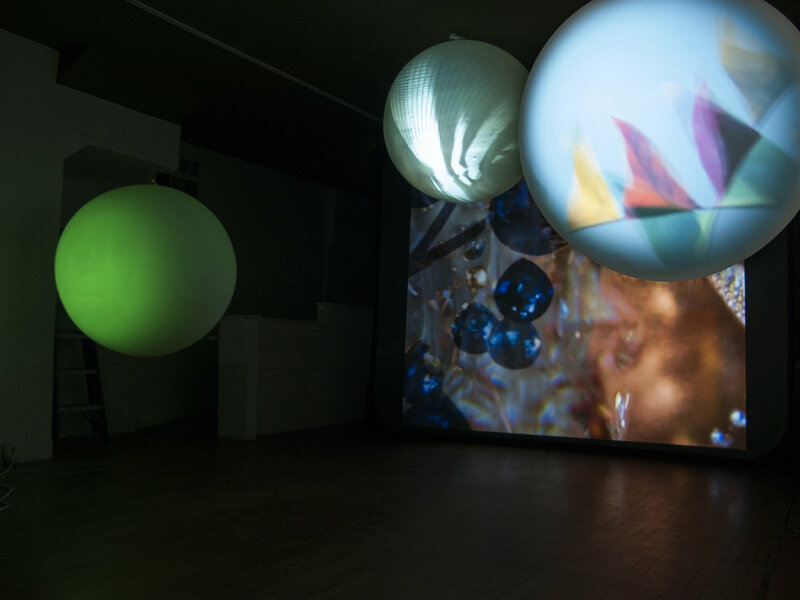 In 2009, her installation Things Are Supposed to Get Increasingly Beautiful Starting Today filled up the main room of the now-defunct Project Lodge venue on East Johnson Street with brighter but equally disorienting projections, some of them cast on large orbs suspended from the ceiling. The venue's front windows were all covered up with paper, and the only way to see inside was through a small viewing slot Isaac cut into the paper. In this case, the space was obviously a modest-sized room, but for a moment you could imagine that Isaac had turned it into a magical little shoebox diorama. For last year's Municipal show at the Madison Municipal Building, Isaac used a projection to turn an oddly truncated hallway in the building's basement into a startling illusion of an infinite corridor, in a piece titled Infinity Vs. Eternity. (The real corridor has a ladder at the end of it. In the days before security cameras, Isaac says, the ladder led to a secret viewing area used to spy on postal workers in the building.) If Things Are Supposed To Get Increasingly Beautiful... showcased the more wondrous and welcoming side of Isaac's work, Infinity exemplified how she can use her techniques to unsettling effect. "Infinity Vs. Eternity." Photo by Chele Issac. The Understory is somewhere in the middle of that continuum, or maybe jumping along it from moment to moment. The viewer is right in the midst of the images and not confined to any one fixed viewpoint. There's none of the perfunctory foam-cube seating one often finds at video-art showings, so the viewer has to make conscious choices about where to look. For Isaac, it doesn't matter where exactly a given viewer looks—it's more about viewers resigning themselves to the fact that that they won’t be able to take in all the information around them. "It becomes a reflection back about how I'm always trying to pay attention and thinking I'm going to miss something," Isaac says. "What the film's trying to do is maybe prove that if you settle into one point...you're not missing anything. But we intentionally did not put seating in there because I want people to turn around and look over their shoulder. But hopefully it becomes less of a frustration and more of a sense of calm, that whatever's happening in each moment is what it is." Isaac has toyed for years with the idea of making one immersive video surrounding the viewer, in an update on the 19th-century 360-degree panoramas known as cycloramas. The sheer cost of doing that convinced her to try the seven-channel route she ended up using in Understory. "The software it takes to blend multiple images together, it's really exquisite, it's really expensive," Isaac says. 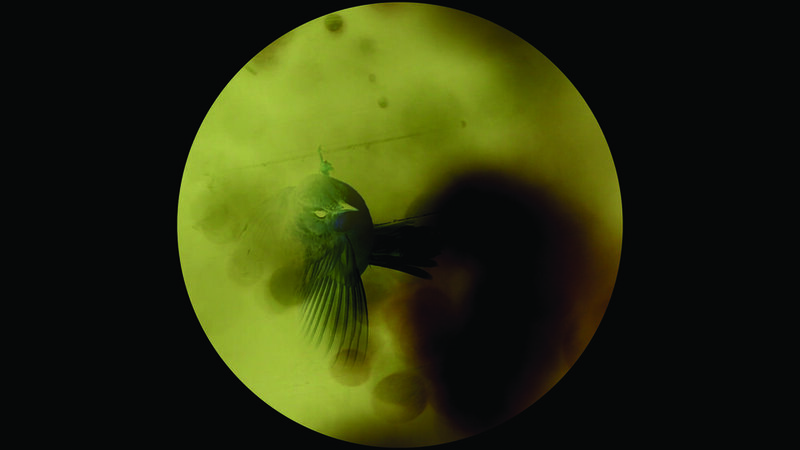 "Leah Kolb, the curator here, several years ago, we looked at the projector, the software, it was like over $50,000. That's fine when you've got an exhibit that's going to be there for several years. When it's a three-month exhibition, no." The physical structure itself, which looks like a squat black funnel from the outside, came before Isaac had fully conceived The Understory. The Discovery World Museum in Milwaukee used it for an interactive video exhibit about five years ago, then discarded it on Craigslist. The museum ended up giving it to Isaac for free, though she had to pay to rent two trucks to bring it home. (It breaks down into fourteen sections.) "My studio's in a church downtown, so the sanctuary was just, just big enough to house this thing," she says, adding later: "I was sort of avoiding this bad boy for a while." The video footage, mostly unstaged and offering nothing resembling a straightforward narrative, makes one feel adrift in the natural world, albeit a natural world shaped by human artifice and a dreamlike thought process. Some images repeat throughout one run-through of the video, but Isaac has intentionally created a lack of cohesion here. "I started with a really huge archive of my own images. Some go back several years and some were just shot within, you know, two months of wrapping up before turning to editing. I wouldn't call it a structuralist film in the historic [sense] of what structuralist filmmakers do, but there's a real structure to it," Isaac says. "At the end of the day I think it's [about] how do you get from millipedes to the ocean to the forest?" In part because of the stress of making seven distinct video channels fit together and going through a large amount of footage, Isaac found herself freaking out a lot in the making of The Understory. To make it work, she had to develop the same kind of acceptance she hopes to engender in the viewer. And she'd like to keep exploring that by continuing to iterate on the piece after its current run at MMOCA ends. "It's taught me a new way of looking and watching and working, and so I think I want to keep drilling down, and juggling seven image, but become calm about it," Isaac says.